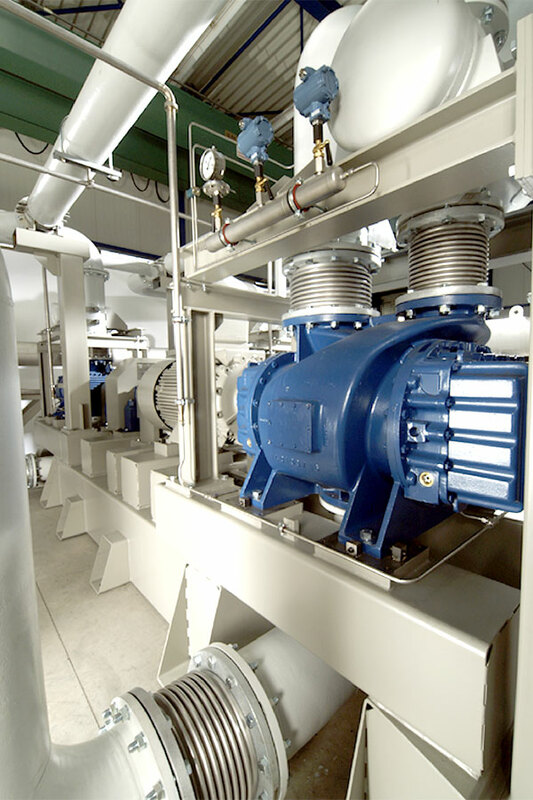 The SGI machine installation in a three stage steel degassing line consisting of a (HV) high vacuum rotary piston blower as first stage to the evacuation side and in the second stage a pre-inlet cooled rotary piston blower from Aerzener Maschinenfabrik. 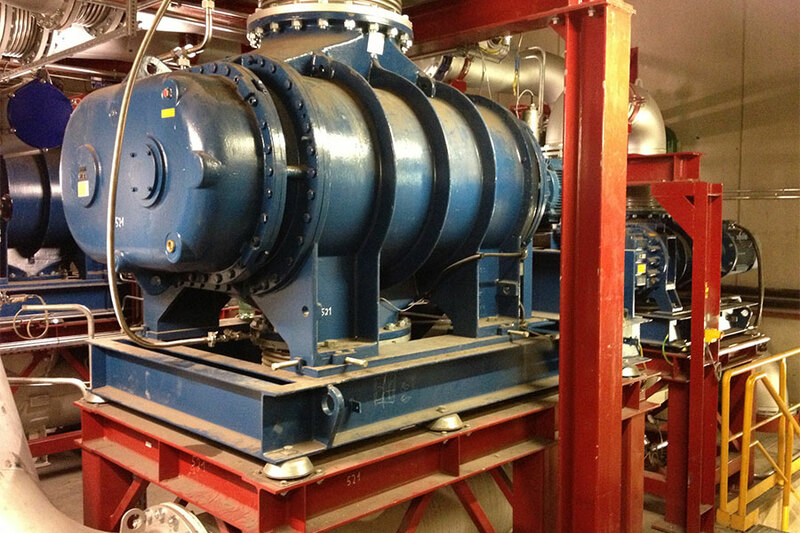 The third stage is a special dry screw vacuum pump. 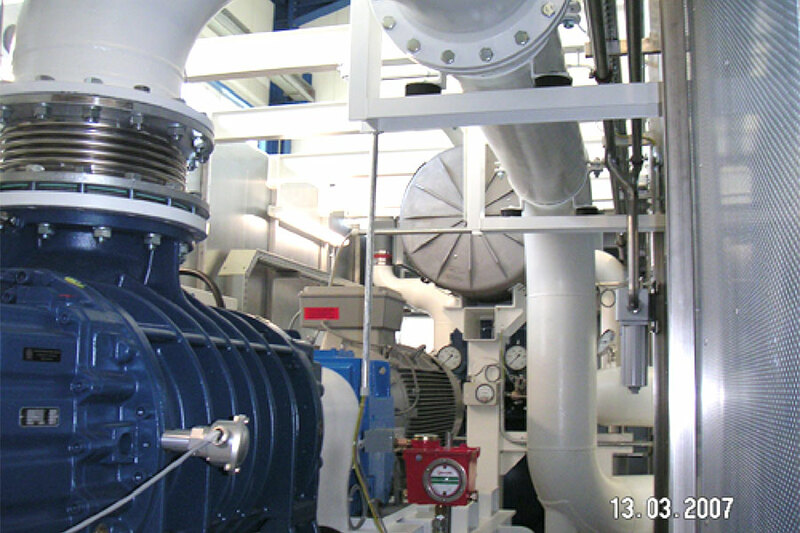 The SGI machine installation in a four stage degassing line system consisting of a (HV) high vacuum rotary piston blower as first and second stage to the evacuation side and in the third stage a pre- inlet cooled rotary piston blower from Aerzener Maschinenfabrik. 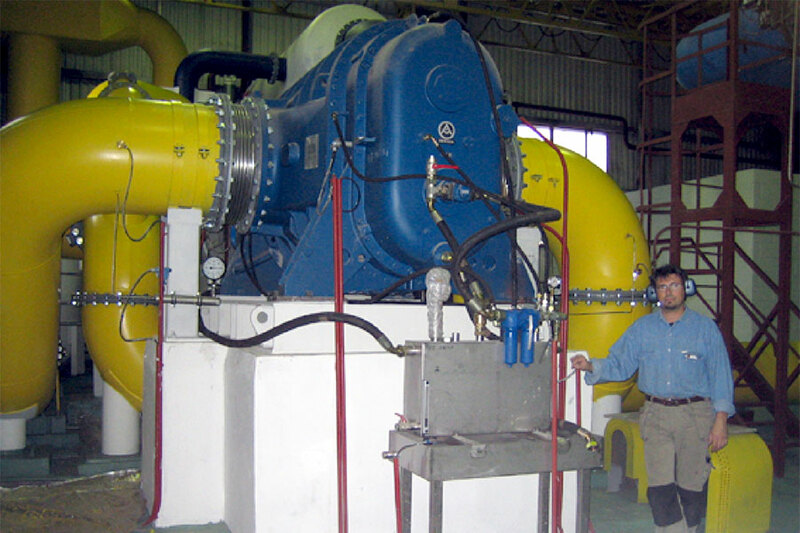 The fourth stage is a special dry screw vacuum pump. 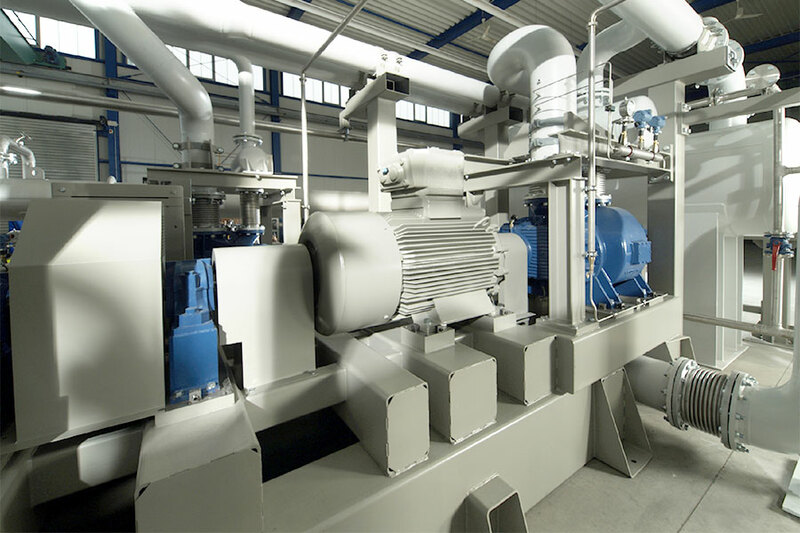 Five stage VD vacuum module line system for very large systems or very low energy consumptions. 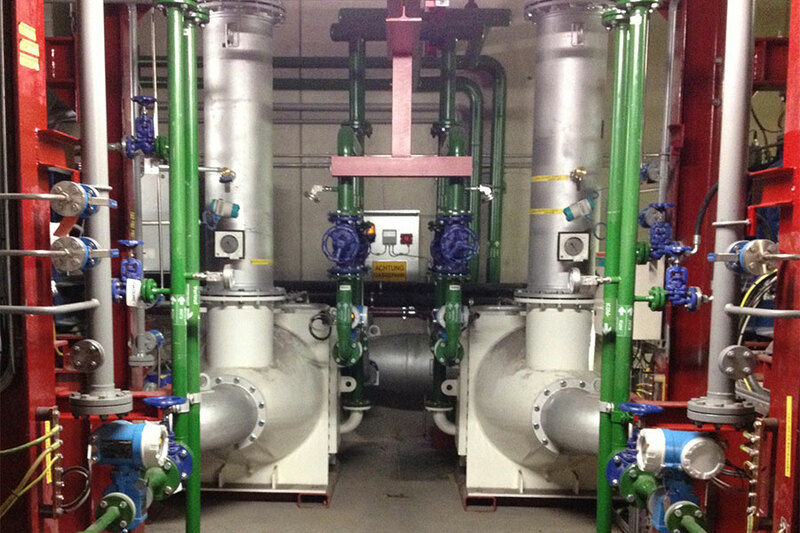 Two stage VOD/RH vacuum module line system, in accordance to ATEX. 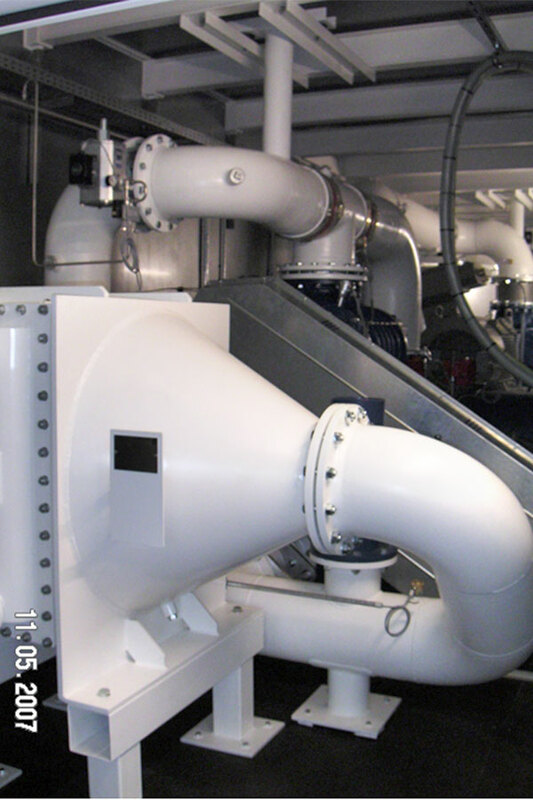 The SGI machine installation in a two stage module line consisting of a pre-inlet cooled rotary piston blower stage combined with a special dry screw vacuum pump. This two stage VOD/RH module line can be a part from a 3,4,or 5 stage VD module line. 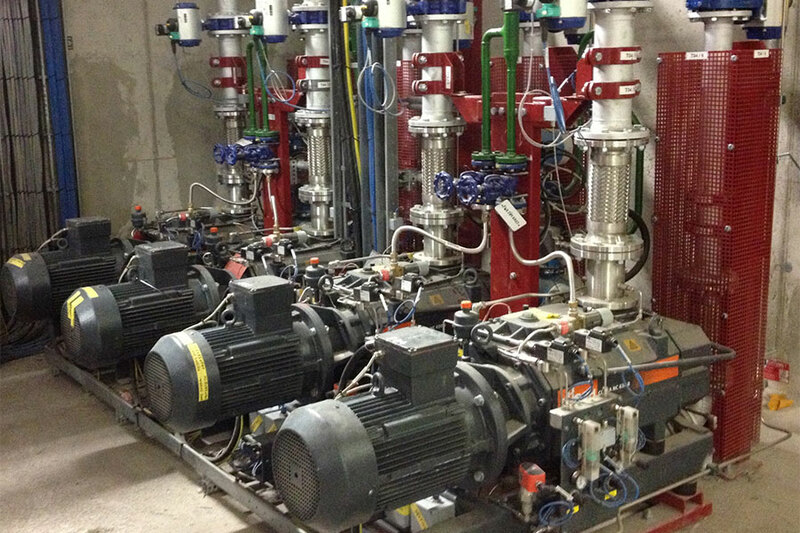 Three stage VOD/RH vacuum module line system,in accordance to ATEX. The SGI machine installation in a three stage module line consisting of a 1. and 2. pre-inlet cooled rotary piston blower stage combined with a special dry screw vacuum pump as last stage. This three stage VOD/RH module line can be a part from a 4, or 5 stage VD module line. The following sizing parameters are based on tonnes of liquid metal. 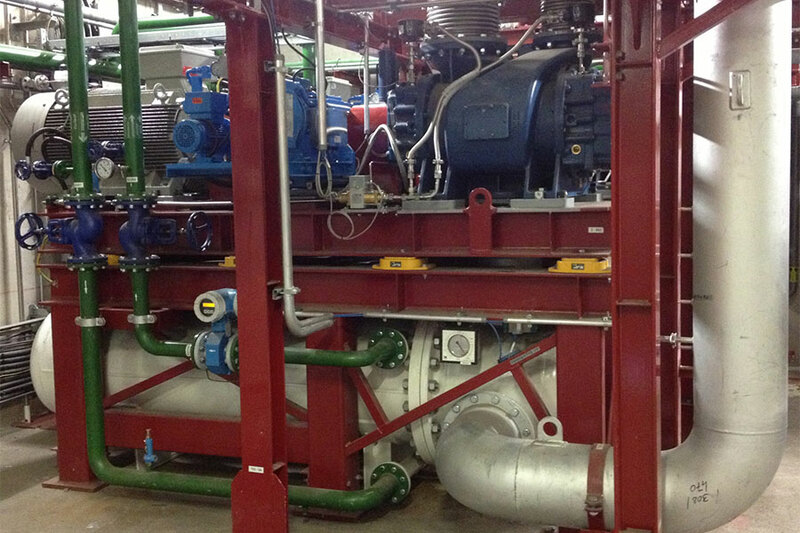 Higher gas temperature in the VOD process will influence thermal load of machine stages as well as mass flow. In order to protect machines therefore pre cooling is required. 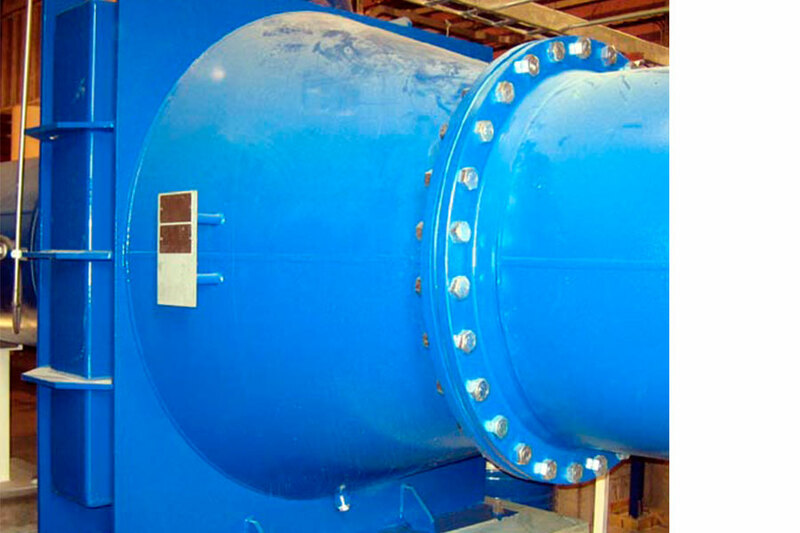 Higher VD machine suction temperature over design 50 to 80°C will reduce suction flow of volumetric HV machine stages. 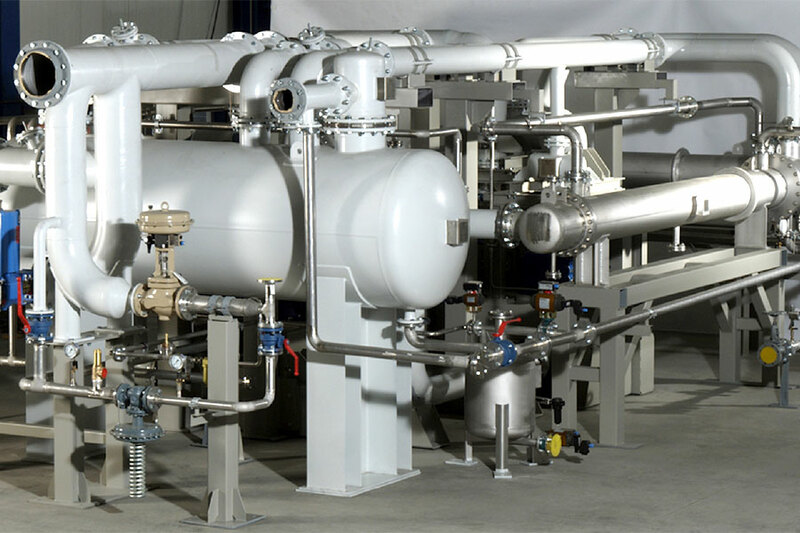 Due to low gas flow density (kg/m3) at stationary VD process at 0,7 mbara, higher gas temperature in VD process will not influence thermal load of machine stages but will influence final suction pressure due to existing latent gas heat in the middle of the VD suction gas pipe. Customer can duplicate or even triplicate the steel degassing modules A1, A2, A2x and B, Bx, B1x or can combine modules depending on requirements for size of VD or VOD/RH process. The machinery for A1, A2, A2x modules can be completely installed on skid or in an machine container. For Modules B, Bx and B1, B1x four stages of five can be installed in on a common skid or in an machine container. Due to the size the first stage will be installed on machine frame outside basic skid or container. The flow diagram Fig.1 is drawn for a three stage vacuum module steel degassing line system, four stages have only one (HV) stage in serial installation more. 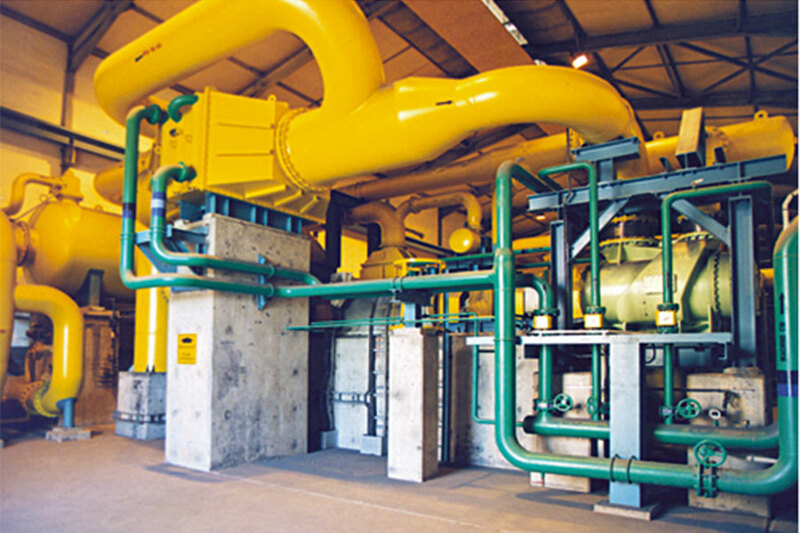 The instrumentation for controlling the system is not shown in the process flow diagram). 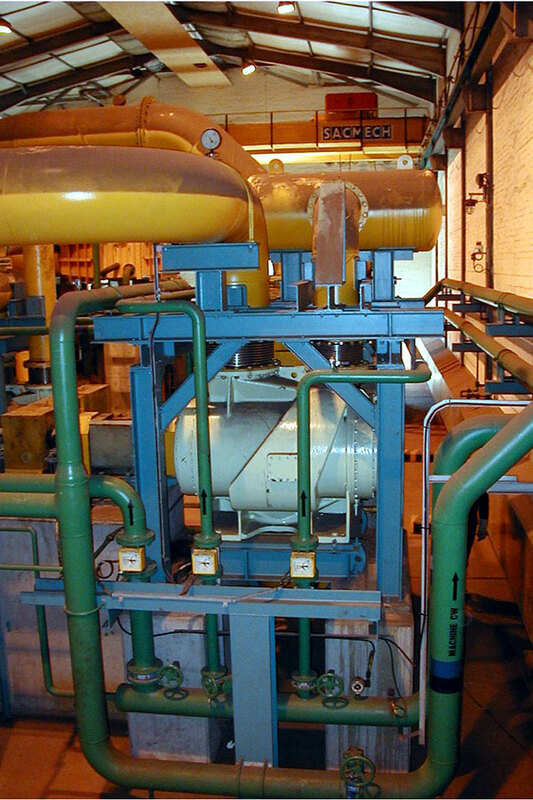 The SGI installation in a three stage degassing line consists a water cooled pre- cyclone and a pre-cooler optional for VOD process, a water cooled bag-filter and as first vacuum machine stage to the evacuation side a (HV) high vacuum rotary piston blower with intercooler and in the second stage a pre-inlet cooled rotary piston blower with intercooler, the third stage are two dry screw vacuum pumps. 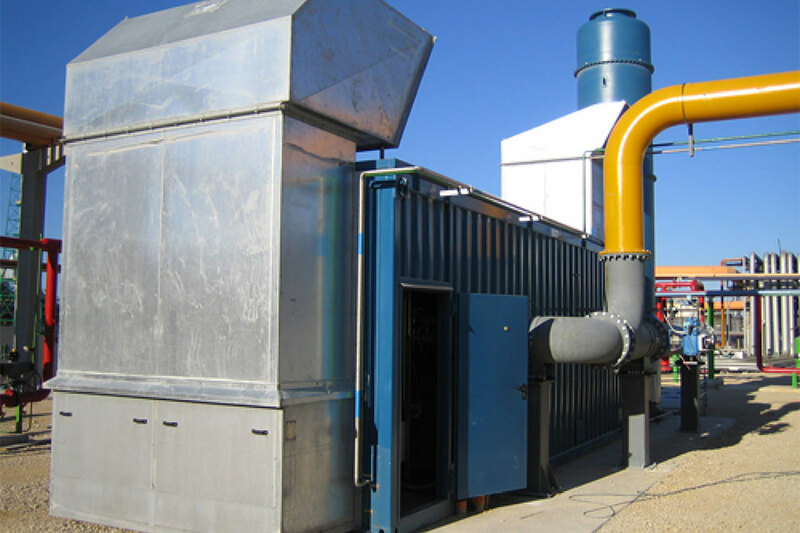 Beside installation of SGI steel degassing line inside a building it is possible to install the steel degassing module lines A/A1and A2 inside a noise protected machine container Figure 2. Short installation time of steel degassing line because machinery inside container is completely mounted, piped, instrumented, wired and tested.